The recipe calls for buttermilk – if this isn’t something you have on hand in the fridge you can make buttermilk by adding 1 teaspoon of lemon juice or white vinegar to slightly warmed milk and letting it sit for 5 minutes until it thickens slightly. 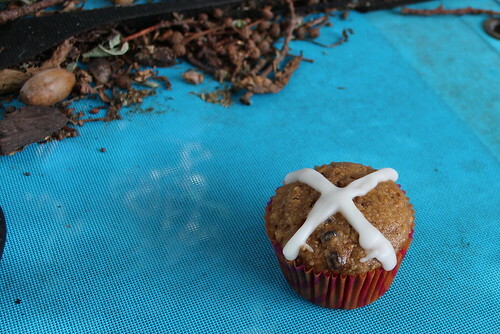 I have also used sour milk and yoghurt (thin runny yoghurt) successfully in these muffins. I usually have to make two batches as one disappears before I manage to pipe the lemon icing on the top. I am not in the habit of icing muffins but seeing as they are Hot Cross Muffins, they sort of seem unfinished without the lemon crosses. They do taste just as good without it though. Preheat oven 180ºC (350ºF), and grease or line 12 muffin tins. Sift flour, baking powder, spices and salt into a large bowl. Add sugar and wheat germ, stirring to combine dry ingredients. Stir in currants & grated apple. Place eggs, oil, buttermilk & apple syrup in a bowl and whisk to incorporate the ingredients. Make a well in dry ingredients, pour in the liquid mixture then mix until just combined. 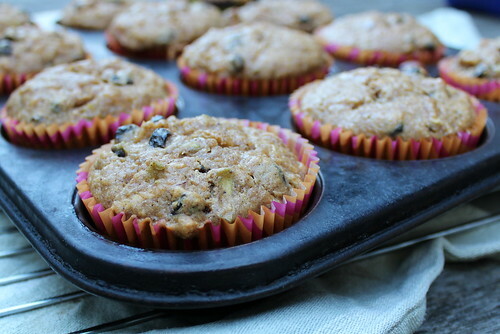 Spoon into prepared muffin tins and bake 18-20 minutes until cooked. When cool, prepare icing by combining the icing sugar and lemon juice. Pipe into a cross shape using a piping bag. 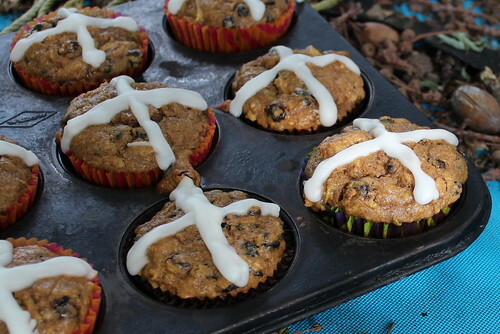 This entry was posted in Baking, Muffins and tagged Easter baking, Easter Muffins, Hot Cross Muffins, muffins by Jo Dohrman. Bookmark the permalink.